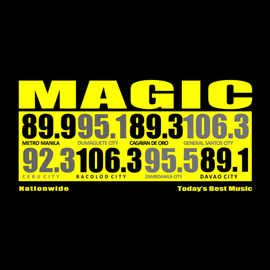 Magic 89.9 and Magic Nationwide plays all of Today’s Best Music 24/7. With a synergy of expertise and experience spanning more than twenty years, Magic 89.9 is the token prime mover in the Philippine Radio Broadcasting. It is dominating the airwaves through its hip line-up of music and Magic Jocks – multi-talented individuals who are prominent everywhere. They are the new generation of radio personalities. Magic also has stations nationwide where Magic Manila’s popular shows, Boys Night Out and The Big Meal are simultaneously played. We are today’s best. Everything’s Magic. Everyone’s Magic. Primary: 20 – 39 yo. Secondary: 13 – 19 yo.